“You rocked the palace!” the prince told the band. camera (Max Mumby/Pool/Indigo/Getty Images) Prince Harry joins Coldplay on stage during the Sentebale Concert at Kensington Palace, June 28, 2016 in London. 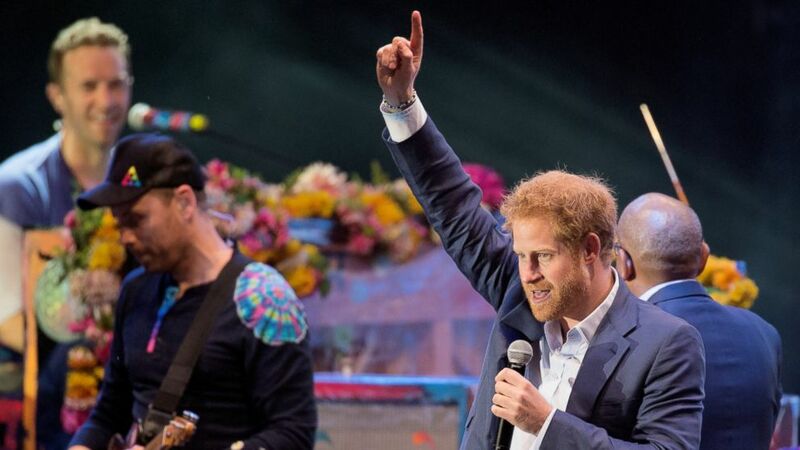 Prince Harry brought down the house tonight with Coldplay headlining a fundraising concert for the prince’s charity, Sentebale, at Kensington Palace. Prince Harry expressed his gratitude to Coldplay, saying "you rocked the Palace!" during the band's finale. The first-ever concert on the East Lawn of Kensington Palace was organized by Harry to raise awareness for Sentebale -- which helps young people struggling with AIDS and HIV, a cause his mother the late Princess Diana pioneered in her life. Pouring rain couldn't dampen the spirits of the band or Harry. “Thank you for standing out in the rain, thank you to the choir that has come all the way from Lesotho,” Harry told the crowd as he sang along with lead singer Chris Martin and Coldplay during the final song on stage. In a bit of role reversal, Harry -- the fifth in line for throne -- even bowed down to Martin during the finale, thanking the band for their performance. Martin joked that the band had rehearsed at a small country farm -- referencing the sold-out concert just last weekend at the Glastonbury Festival. Martin noted that they were at Kensington Palace to support Prince Harry and the importance of the work he was doing everywhere to help those in need. The band played a 10-song gig to an intimate crowd of 3,000 who had nabbed tickets that sold out in less than an hour. Before Coldplay took the stage Harry delivered a heartfelt speech. "What I saw there was a country with significant challenges; some of the world's most vulnerable young people, robbed of their childhoods - forced into work due to extreme poverty and the loss of one or both parents to the devastating HIV/AIDS epidemic. In some cases the 'lady of the house' was a 12-year-old girl looking after her brothers and sisters." Prince Harry added: "This is a topic that has drifted from the headlines, but remains an urgent challenge. In southern Africa, the epidemic remains the biggest killer of adolescents. Here in the UK, more people have the virus than ever before. "What we know is that HIV is a virus that thrives off silence and feeds on stigma. Every single one of us has a responsibility to educate ourselves. To do what we can to speak out and stamp out the silence, ignorance, and fear that the virus needs to win," he told the crowd at Kensington Palace. Prince Harry founded the charity more than a decade ago with Prince Seeiso after spending his gap year at 19 in LeSotho. More than one in three children are orphans having lost a parent to AIDS-related illness in the sub-Saharan country. HIV is the number one cause of death in 10- to 19-year-olds in Africa. Sentebale -- which means forget me not -- was named in honor of Princess Diana and Prince Seeiso's mother. Prince Seeiso paid tribute to Harry’s work on behalf of the vulnerable children in Africa at the concert. “You came to Lesotho as a young man and today you stand tall and proud and are walking among the giants. You are making a difference. That is a testimony to the mother that we so love, that is Princess Diana. You in her footsteps have gone beyond the call of duty and gone to those dark corners and reached out your hand to the most vulnerable children of Africa and in particular, Lesotho," Prince Seeiso. All of the proceeds from the concert by Coldplay will be used to fund programs to benefit the children of Lesotho who are struggling with the disease. The charity has recently expanded to neighboring Botswana. In addition to Coldplay, Joss Stone and the Basotho youth choir joined Harry on stage. Earlier in the day, Kensington Palace announced that Prince Harry will redouble his efforts on raising awareness about HIV and AIDS and its impact on young people over the next year. Harry will travel next month to Durban, South Africa, for the 2016 International AIDS Conference on behalf of Sentebale. "Building on his decade of experience in supporting young people with HIV in Lesotho through his charity Sentebale, The Prince is now determined to help his generation understand that the battle against the disease has not yet been won and still needs fighting," Kensington Palace said today in a statement.